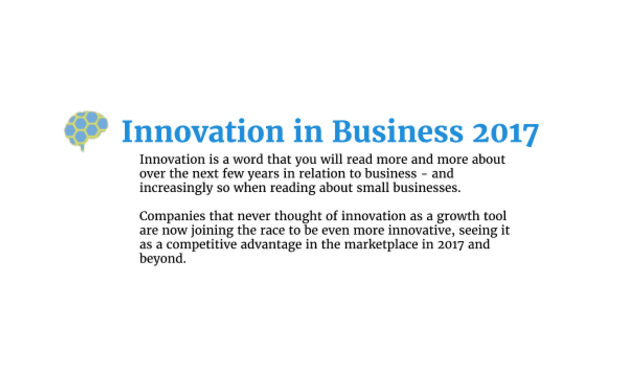 Innovation in Business 2017 #Infographic ~ Visualistan '+g+"
Covering statistics from business surveys about innovation by numerous sources including Bloomberg and PwC, this infographic about innovation in 2017 shows how smaller and smaller companies are adopting innovation practices in their companies and not leaving their futures to chance. Also shown are the top 10 most innovative economies of the world, according to the Bloomberg Innovation Index alongside graphs that show the cost of and poor chances of new product failures, alerting businesses to get innovation behaviors correct to ensure a much higher chance of new product innovation success. As for innovators themselves, one of the charts in this infographic shows how and why innovators do what they do, with the leading reason being superior product performance. This information startled many when released as financial gains were thought to be high on the list when innovating. It turns out that true innovators want better products with advantages over competitors products and even producing new innovative products without spending much money was a key goal.